For the samurai in pre-industrial Japan, a sword was much more than a weapon. It was a symbol of their identity and an extension of who they were as a man. Two swords were pivotal to the military elite. 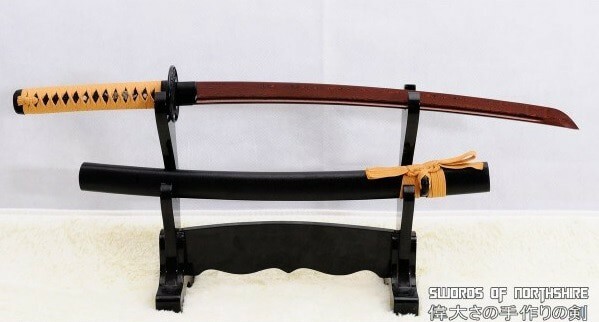 The pair formed what was known as the Daisho (meaning big and small) and consisted of the Katana (long sword) and the Wakizashi (small sword or side arm). The importance of the Wakizashi cannot be overstated. The fact the design remains so popular today many centuries later is an indication of this. 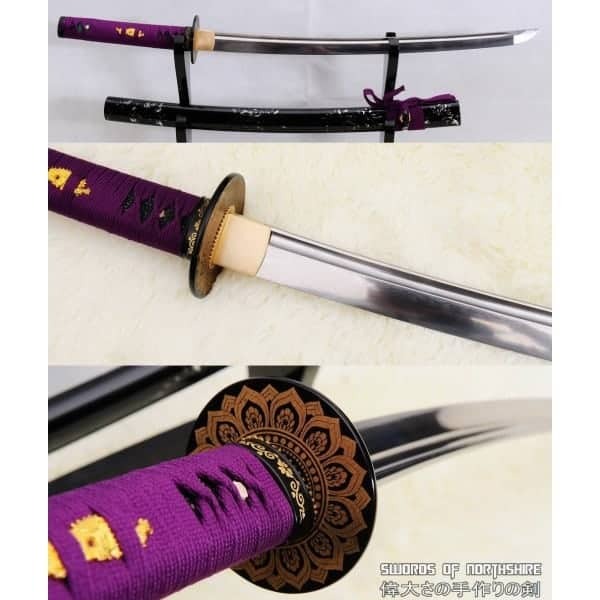 But with such a wide range available, from antique replicas and modern day reproductions (all built to differing standards), buying the best wakizashi in 2018 is riddled with hurdles. That’s where this guide aims to help. We have pulled together 5 of excellent modern day, hand crafted wakizashi swords that you can own without remortgaging your house. 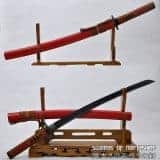 All are constructed to the highest standards, and whether you are after a beautiful show piece, or a sword for use in the dojo, there is something here for you. 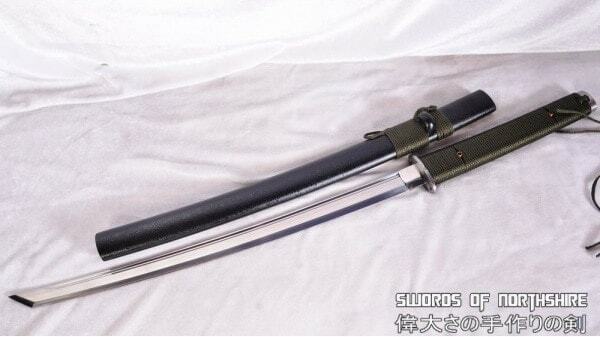 The katana was larger and more cumbersome and was generally worn while outside. When a samurai entered a house he remove his armour, and lay down his katana – the wakizashi would remain with him for protection. In many ways it was the most integral weapon to the samurai of the day. Furthermore, if a samurai was ever to commit seppuku (a ritual suicide), it was the wakizashi that he used for the final act. How long is a wakizashi? The appropriate length of the Wakizashi is a question that often arises, especially from those that wish to have the sword custom made. 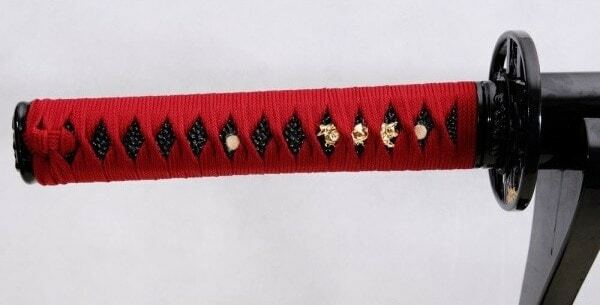 Historically the length of a wakizashi was between one shaku (30.3cm) and two shaku (60.6cm). The majority of modern day reproductions keep to those dimensions. 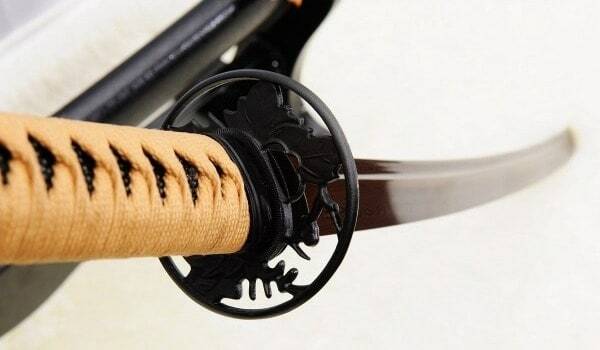 The best way to understand the style of the wakizashi is through images. Below you will find a small gallery with a selection of the high grade traditional style reproduction swords that are available today. 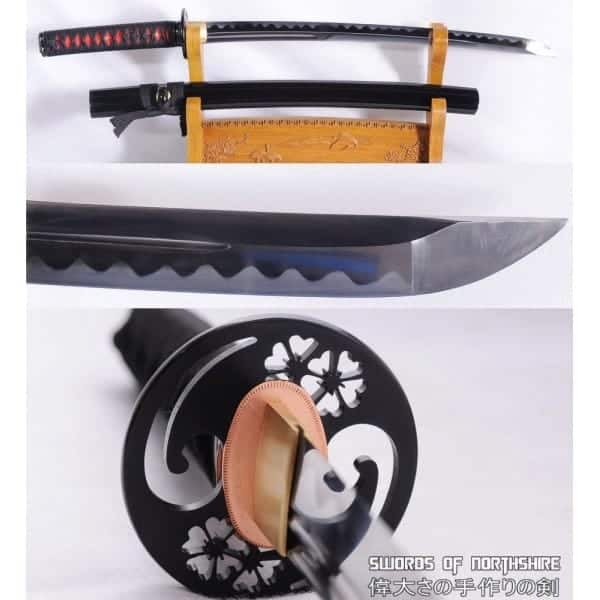 It is worth remembering that you can purchase several types of wakizashi. 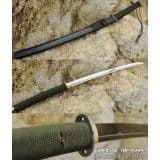 There is the tactical wakizashi that has proved popular as a survival tool, (more on this below). They are strong and sharp and generally lack the overt aesthetic that you expect to see from the swords designed to be wall hangers. 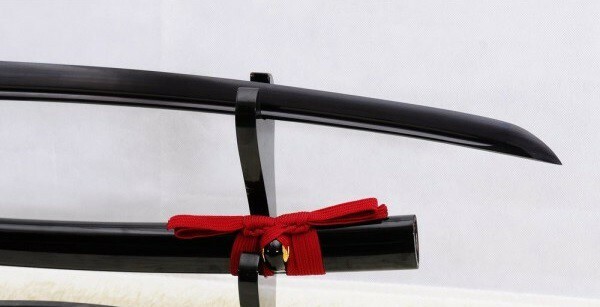 Wakizashi used in the dojo should also prioritise hard, durable construction over beautification, however that doesn’t mean such swords lack finesse. Because the wakizashi is a short sword (and is designed to be worn as a side arm along side the larger katana), the use was quite specific. 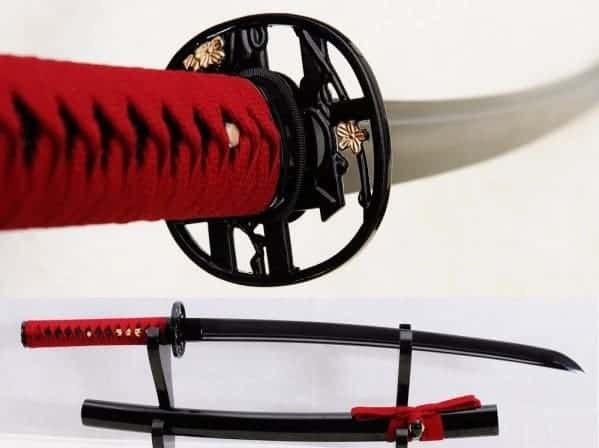 The wakizashi is the final line of protection, carried at all times it can be operated with one hand (unlike the katana that requires two) and used as a close combat slashing or stabbing weapon. If you wish to practice with a wakizashi sword it makes good sense to get proper one on one tuition (they are a deadly weapon after all). 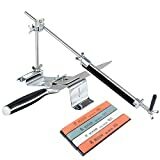 While videos and instructional articles may help with the basics, nothing can replace the invaluable help and guidance you would get from a sensei at your nearest dojo. 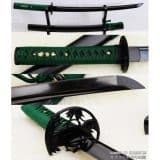 As mentioned above, it is possible to purchase modern tactical wakizashi swords from well know brands such as Cold Steel and United Cutlery. While the United Cutlery tactical wakizashi does not make our top 5 picks, this type of sword has proven popular with survivalist who wish to arm themselves with something serious while out in the field. 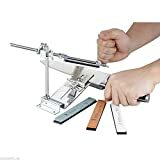 The fact is, the short sharp blade, good balance and overall efficiency of the design, makes them a good tool for splitting wood and of course, for self-protection in extreme conditions. Add this to the idea that the tactical wakizashi can effectively be worn at all times, makes it an ideal sword for survivalist scenarios. For our top 5 we have pulled together the best wakizashi for sale at prices the everyman can afford. 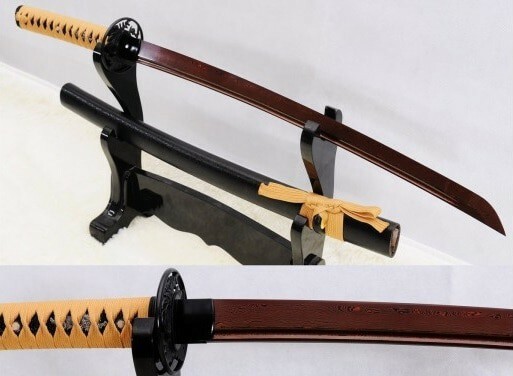 Each of these swords currently retails for less than $1,000 yet are constructed using age-old techniques that existed during the time of the samurai. Our top pick best wakizashi for 2018 is this hand forged, folded steel custom sword from Swords of Northshire. 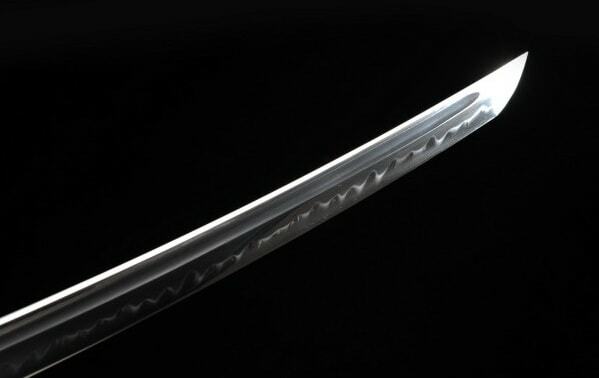 This beautiful, yet affordable Wakizashi is made using traditional Japanese processes. Forged from folded steel, (folded 13 times in a manner that results in over 8,000 layers), the hand sharpened edge is nothing short of formidable. The finish is what you would expect on a sword of this quality. The blade is specially treated to show the unique and beautiful colors that have been incorporated into the design. The aesthetic attention to detail stretches to the sleek, black matte hard wood saya. 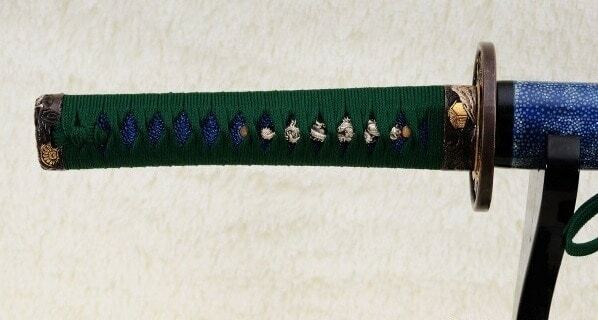 There is also a very pleasing silk sageo/ito that forms part of the finished design. The robust build quality utilises traditional skilled craftsmanship and components. For instance, the full tang of the blade is attached to the handle with two bamboo mekugi. A hand engraved Mei(signature) is also embossed into the design.. Finally, this stunning example of how to create a wakizashi sword is shipped with a genuine same (rayskin). 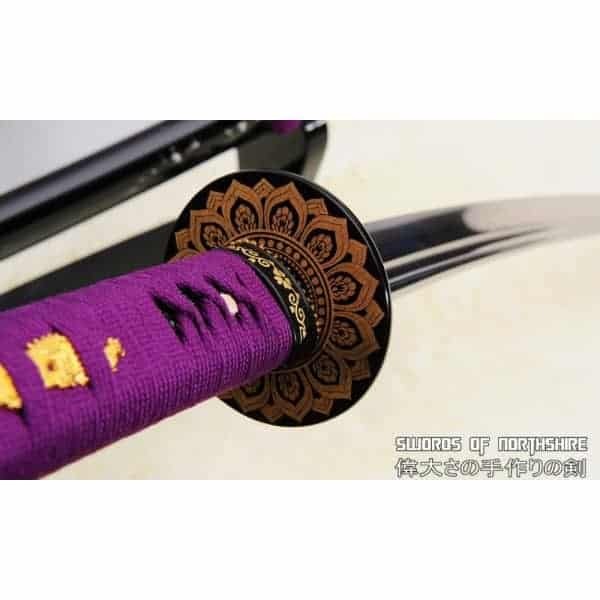 Designed for dojo use this is not as elaborate in design as some of the traditional style wall-hanger Wakizashi available. 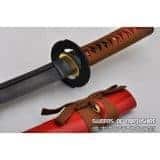 This hand forged red folded steel custom samurai wakizashi sword is a fantastic all round option at a very competitive price. Beautiful and practical, sharp and hard-wearing – you can use this in the dojo with pride. Highly recommended. Now we turn to what is basically our top pick outdoor survival tactical wakizashi specifically designed for practical use. Because of this what it lacks in overall aesthetic it more than makes up for in function. The blade is made from 1095 high carbon steel, providing you a sufficiently robust (and sharp) edge for everyday use. 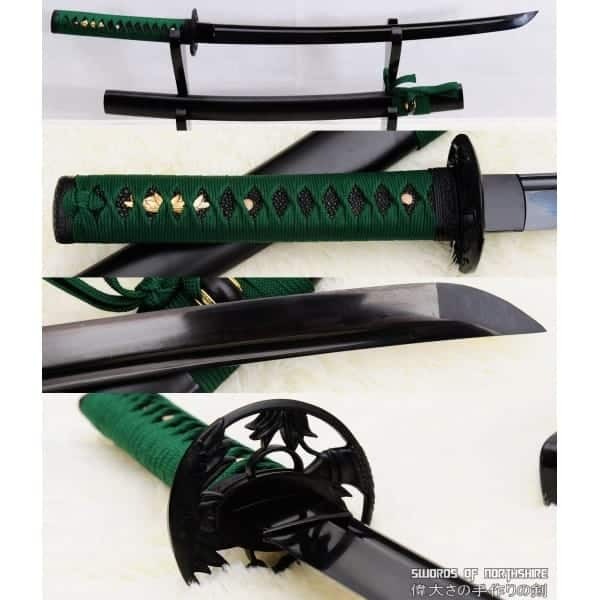 Furthermore, as one of the best tactical wakizashi you can buy today, the sword is actually hand forged using traditional methods to remove impurities from the steel. Now even a 1095 carbon steel blade has the strength and flexibility required for out in the field use. If you are a survivalist, this could well be the wakizashi you have been waiting for. The full tang blade is riveted to the handle (tsuka) using copper components (traditional bamboo would not necessarily hold up over extended use). The sword also comes complete with a hand engraved Mei (signature). Despite the fact this wakizashi doesn’t prioritise aesthetic embellishment, the sword still contains its fair share of stylistic additions. A black matte hardwood saya, nylon sageo/ito and iron fittings all come with this practical wakizashi solution. 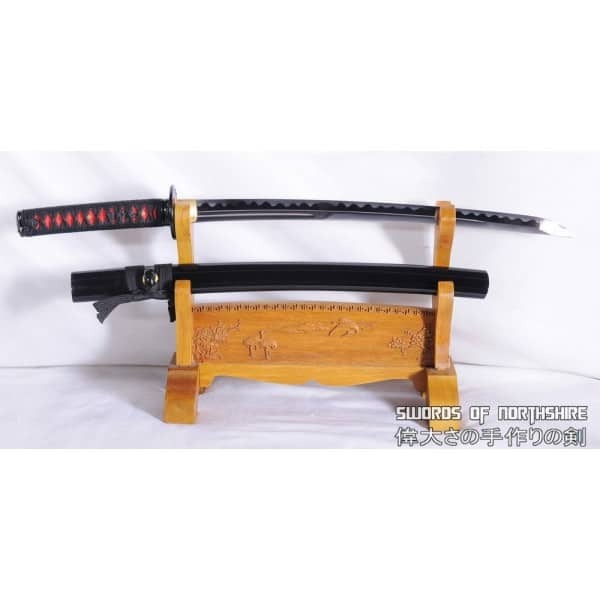 This is simply one of the best tactical wakizashi swords you can buy. Built from the ground up to be used for outdoor activities such as hunting, hiking and field survival it is a durable sword that will withstand tough conditions. Overall an excellent option for today’s outdoorsman. From the practical application of our top pick tactical wakizashi, we now have this – a sword designed specifically for display. 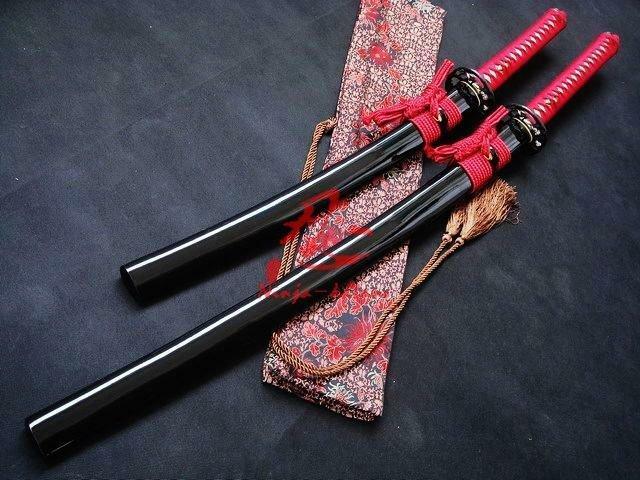 This 1095 high carbon steel double blade clay tempered twinblade wakizashi is quite simply beautiful. If you are after a wall hanger, your search may well end here. Made of one piece 1095 high carbon steel, the blade is an excellent example of the fusion of modern and traditional design processes. In fact, Swords of Northshire state that there is very little that resembles this design on the market in 2018. As you can see from the images, this wakizashi is extremely unique. 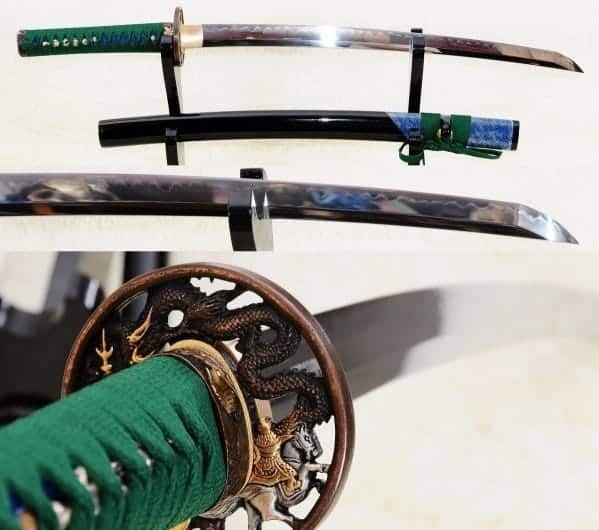 Featuring two wakizashi blades on either side, with a silk wrapped tsuka (handle) in the middle, the overall aesthetic becomes a genuine talking point for those that are fortunate enough to see it on display. The clay tempered steel is polished to achieve a mirror-like surface which only adds to the wow factor. 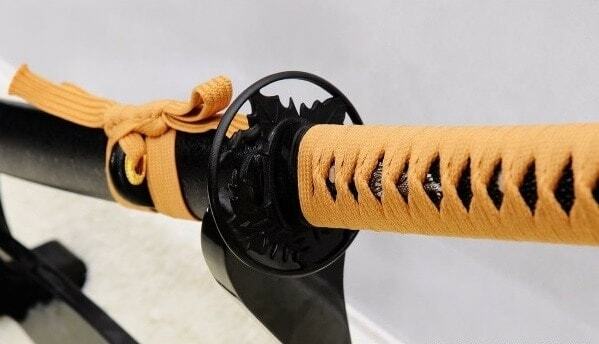 Despite the fact this sword is not designed to be used in practice, attention to detail in the forging process goes towards increasing the blades’ strength. They are repeatedly heat treated and hand forged to remove impurities. The clay temper process also results in that beautiful hamon (temper line) that runs through the length of the blade. To add to the overall impact of the sword from a visual perspective, it comes complete with two black lacquered hardwood saya. There are also the obligatory silk sageo/ito as well as a genuine same’ (rayskin). If you want a statement in a case, this is it. It’s merely a display item. 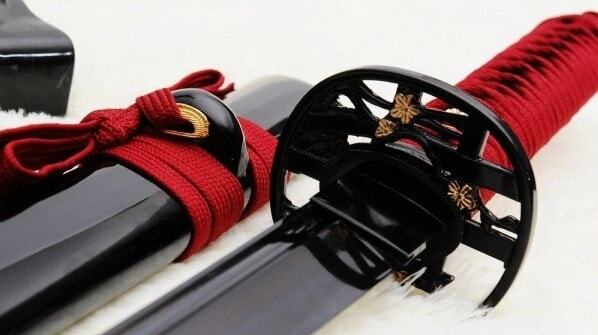 You cannot use this wakizashi for practical purposes other than to look at it. Craftsman of the samurai era built beautiful swords. This wakizashi takes inspiration from that ethos to create something that is truly unique. The bottom line being, the overall aesthetic provided here will not disappoint. 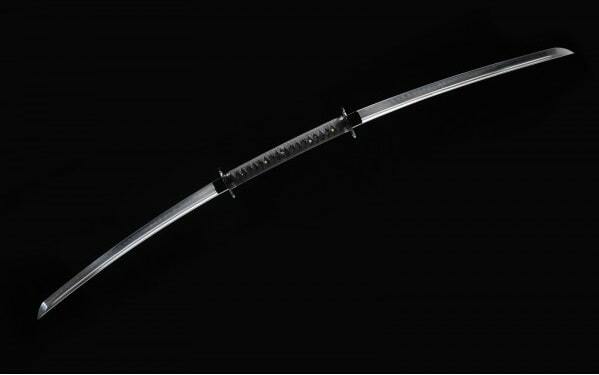 If you’re after a truly stunning wakizashi to put in a display case or hang on the wall this is the one to buy. Now we have a wakizashi that combines practicality and aesthetic into one overall very pleasing package. Made of 1095 high carbon steel the clay tempered process creates that beautiful hamon (temper line) that really does set a sword above its lesser peers. The 14 stage hand polished finish is also well and present, meaning if you do just want to look at your sword, you will not be disappointed. Having said that this is still a very strong sword designed to be used in practice. The blade is repeatedly heat treated with extra processes that aim to move impurities. 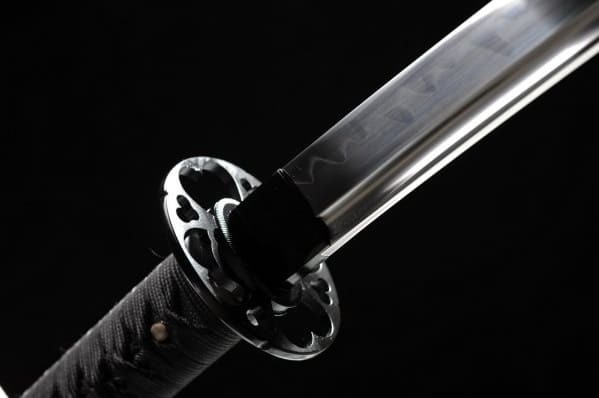 The blade is also full tang meaning it can withstand the knocks and bangs that come about when a sword is actually used rather than merely displayed. To add to the notion of practical application, the edge has been hand sharpened before leaving the workshop. If you end up using this in the dojo, the competition better watch out. As with the other swords in our top 5 list, this wakizashi comes complete with a silk sageo/ito as well as a genuine same’ (rayskin). A hard wood saya that has been partially wrapped with genuine rayskin is also provided. Despite the broad practical application, the tactical wakizashi reviewed above is still the preferred choice for outdoor use. A strong and durable all rounder, with enough attention to detail in the looks department to be more than pleasing on the eye. If one of the other swords reviewed in our top 5 do not tickle your fancy, this could be the one that covers enough bases to be the one for you. The final entry in our top 5 best wakizashi review round up is this budget buy 1060 high carbon steel offering that retail at less than $200. 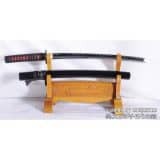 In short you have an entry level sword that combines quality at a reasonable price point to please most pockets. Traditional methods are still employed in its construction however. The hand forged and polished 1060 carbon steel blade is well balanced, sharp and strong. You will have no issues using this sword in the dojo. Despite the low end price, the steel blade has been designed from the ground up with regular Iaido & Kenjutsu use in mind. Aesthetics are still considered mind you; after sharpening, the blade is etched with an oxidation process that results in a very pleasing jet black colourization. A black lacquered hardwood saya is also provided, alongside the silk sageo/ito and genuine same (rayskin). The tsuka is silk wrapped tsuka too. 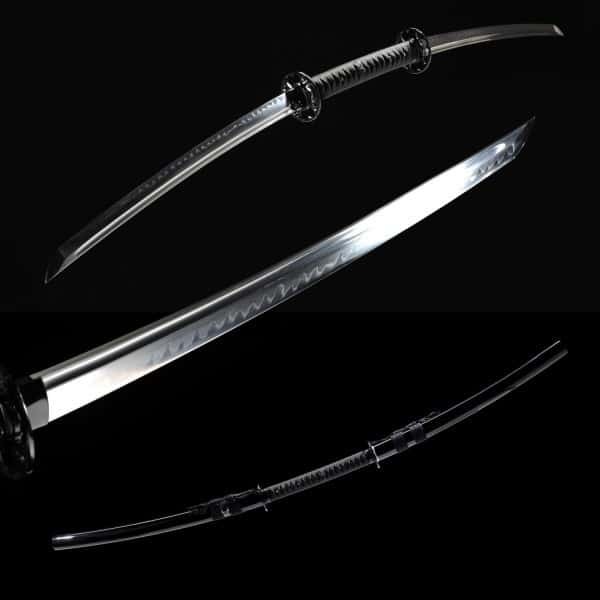 Durable 1060 carbon steel sword designed for everyday martial art use. The 1060 carbon steel is not as strong as other steel swords you are likely to encounter in the dojo. If you are looking for a cheap, practical wakizashi to use for training this is definitely worthy of your consideration. A highly recommended solution to what the sword purports to do.